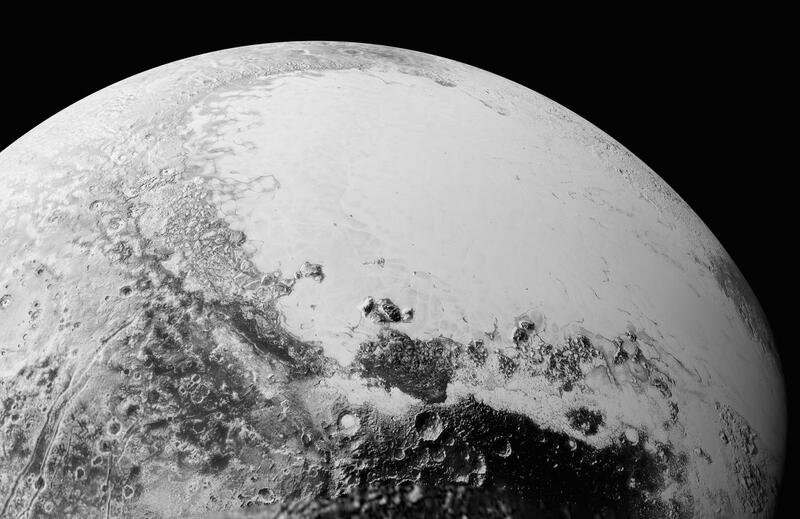 After a couple of months off to let the Pluto scientists breathe and get their lives back in order, a new batch of images of the tiny world nearly 5 billion kilometers away has been released. 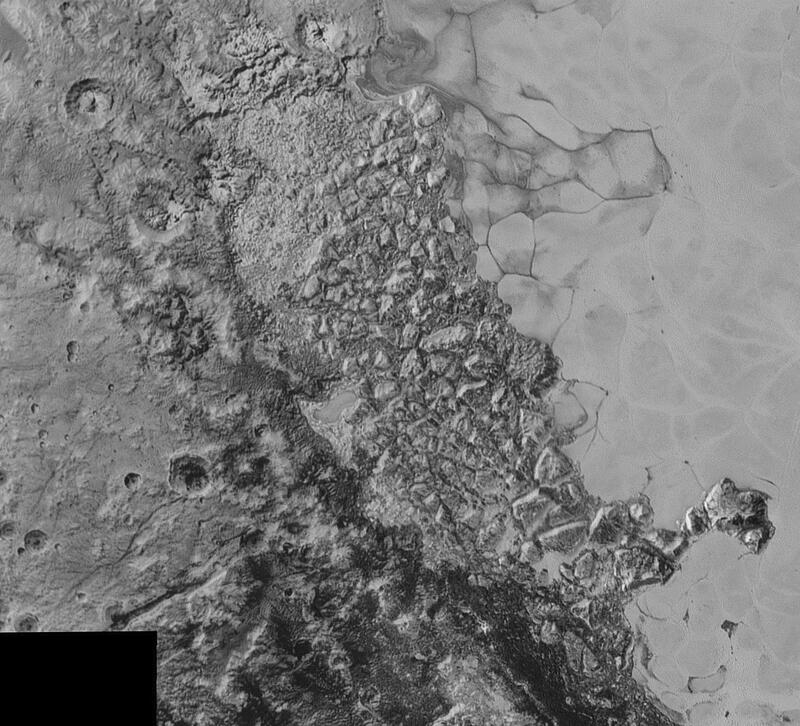 These are from the encounter of the New Horizons spacecraft with Pluto back in July, and have much higher resolution. New Horizons can’t transmit data back to Earth quickly because of the huge distance, so we got “quick look” shots before. But these? These are far, far better. This is a mosaic of several images, stitched together and mapped to keep the spherical nature of the overall view intact. 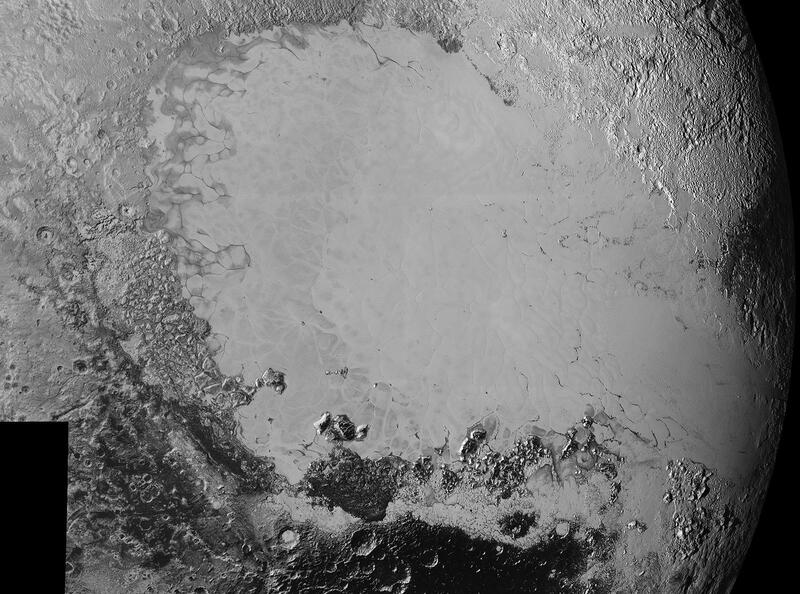 It shows the left-hand side of Sputnik Planum, the “heart” region on Pluto, which is most likely a plain of frozen nitrogen. It abuts against a much darker highlands area, obviously much older due to the number of craters there—the flatter plains area is younger, possibly resurfaced in recent geologic history. There are no craters in the plain down to the resolution of the image that I can spot. The left lobe of the heart, Sputnik Planum. In this shot we’re looking more directly down on the heart. This really makes it look like glacial flow, viscous ice moving slowly, flowing around obstacles. Interesting: The lighter region in the center gives way suddenly to somewhat darker ice on the left, along a segmented line. I can’t wait to hear from the scientists about that! Where the (nitrogen) ice meets the shore. This is a closer view of the left-hand side of the heart where it meets up with the higher elevation features. Note the swirl near the top! That’s exactly what you’d expect from near-fluid movement. But remember, we’re talking nitrogen ice here, not water! The craters on the left are interesting. Many appear to have rings in them, like little craters inside. We see something similar on Mars and the Moon, and usually indicates a subsurface layer with a different tensile strength (on Mars, for example, it’s ice under rock). 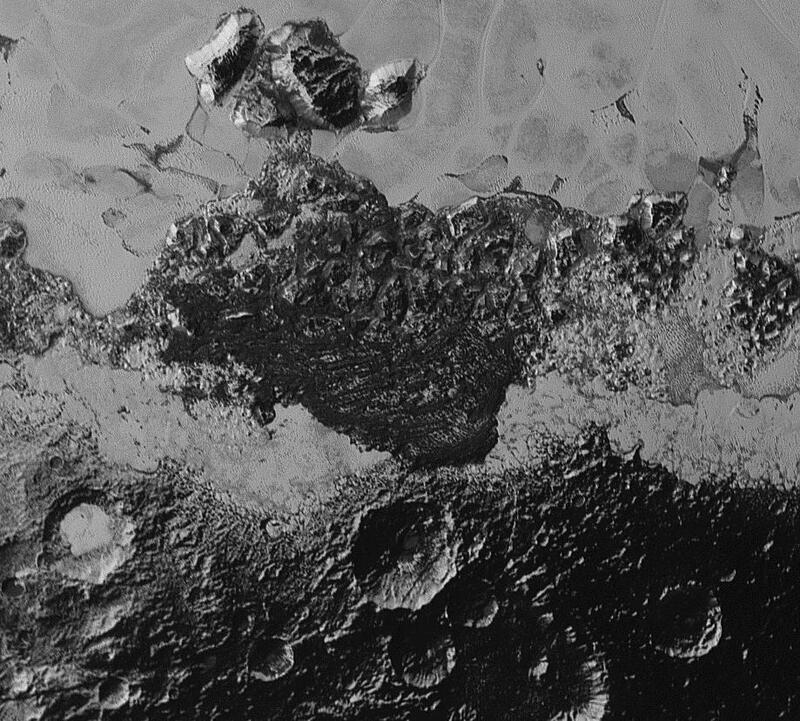 A dark region with craters and odd ridges. Look at those craters! This is the dark region at the bottom of the bigger view above. Many of the craters have radial ridges down the inner wall. Collapse features? Gullies from runoff? Some of the parallel features in the central dark triangle (and in a smaller area off to the right) look almost like dunes, too. I doubt that’s what they are; the atmosphere on Pluto is a tad thin. Perhaps they’re compressional folding. I’m totally guessing here. It’s fun, but take it with a planetoid of salt. Charon! 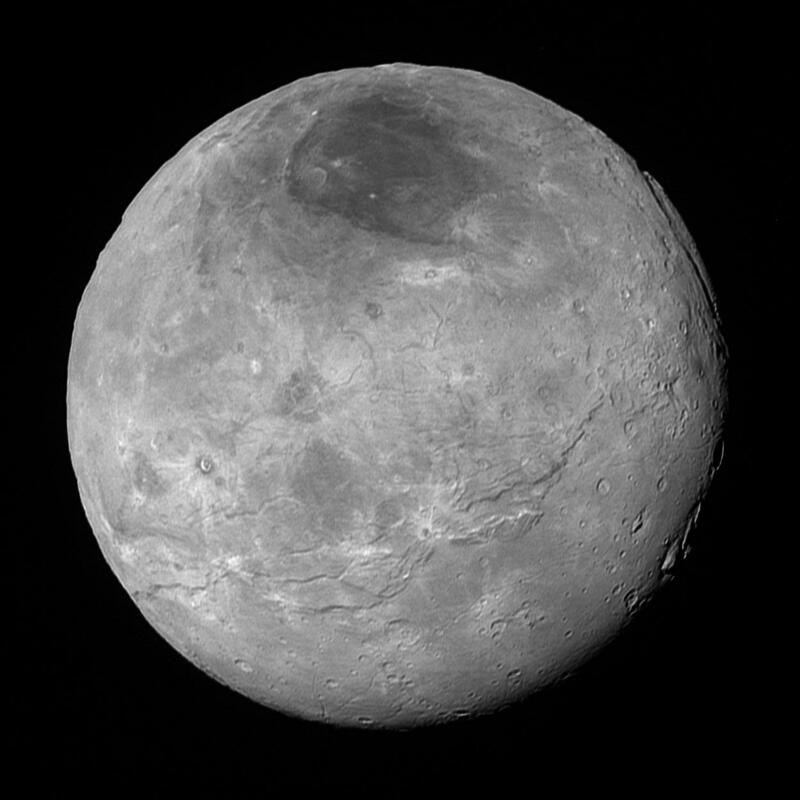 Pluto’s biggest moon, half the width of Pluto itself. That dark spot near the north pole is very peculiar (and also red, which you can’t tell here). Besides the obvious features, the horizon is … lumpy. This moon has seen a lot of action, I think. That canyon to the upper right is huge. This image is much higher resolution than what we saw back in July, and shows features far smaller, down to less than 5 kilometers in size. Pluto, backlit by the Sun as New Horizons pulled away. This is what the New Horizons probe saw as it left Pluto behind: the world backlit by the Sun off to the right, the thin atmosphere lit up. The left image is lightly processed, but the one on the right shows layers of haze in the atmosphere. And this astounds me: In the left image, you can see a very faint parallel streak in the haze. Those may be crepuscular rays; shafts of sunbeams caused by surface features casting shadows! These happen on our own fair world all the time, and one of my favorite atmospheric effects. And this is just the beginning. There are hundreds more of these on New Horizons, waiting patiently for their turn to be beamed back to Earth. There will be more released over the coming months. Stay tuned for more outer solar system awesomeness. Tip o’ the lens cap to Emily Lakdawalla, who of course found the pictures before anyone else.